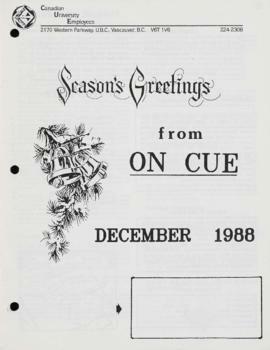 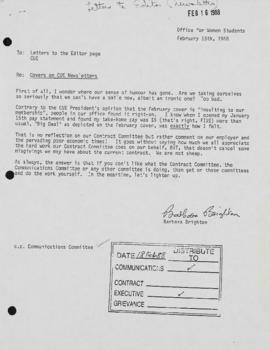 File contains CUE newsletter On Cue and other Communications Committee records dated February 1988 to December 1988. 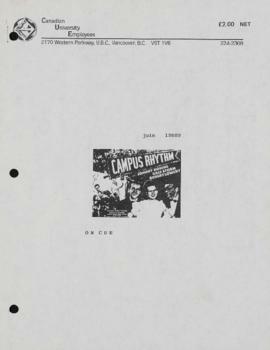 Other records include letters to the editor of On Cue, a brief written history of CUE, a photocopied Vancouver Sun article dated June 23, 1988 regarding student admissions, and correspondence from CUE President. 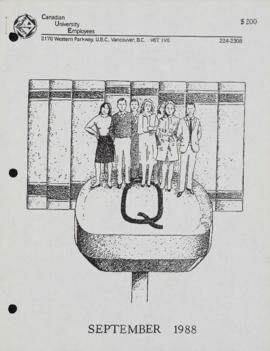 Topics of correspondence chiefly regard choice of covers for On Cue. 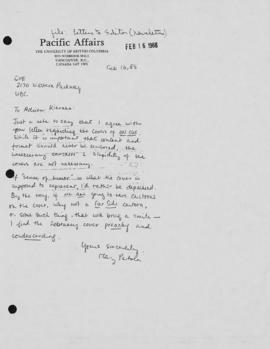 On Cue, February 1988 includes article against Free Trade, notice of Safety Committee meeting, letters to the editor, article discussing privatization, personals, notice of BCFED boycotts, minutes of extraordinary membership meeting dated December 16, 1987, and CUE financial statements. 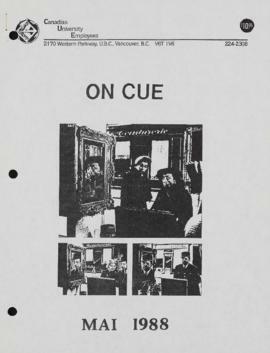 On Cue, December 1988 includes President's report, Communications Committee report, Grievance Committee report, Job Evaluation Committee report, reprinted Canadian Labour Congress article, article on types of bargaining, reprinted Canadian Labour article on safety concerning chemical hazards, call for boycott of California table grapes, CUE financial statements, minutes of Executive Committee meetings dated October 26, 1988 and November 9, 1988, minutes of general membership meeting dated October 27, 1988, and notice of general membership meeting dated January 19, 1989. 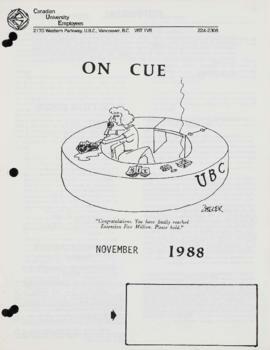 On Cue, November 1988 contains President's report, Communications Committee report, Grievance Committee report, Education Committee report, notice of cancellation of November membership meeting, recruitment initiatives, notice of Payroll Department understaffing, news from other unions, reprinted article on free trade from the Vancouver Province, article on types of bargaining, personals, letters to the editor, minutes of Executive Committee meetings dated September 14, 1988 to October 13, 1988, minutes of general membership meetings dated September 29, 1988 and October 20, 1988, questionnaire regarding ABS Committee representatives, CUE representative list, and agenda for general membership meeting dated November 17, 1988. 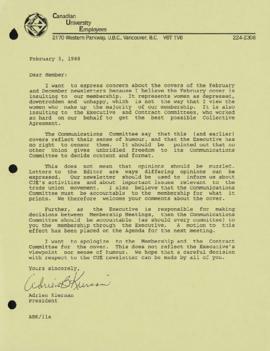 On Cue, October 1988 contains President's report, Communications Committee report, Grievance Committee report, article on the collective bargaining process, notice regarding newsletter delivery, Executive Committee meeting minutes dated August 10, 1988 to September 7, 1988, personals, financial statements, CUE representative list, and notice of recruitment campaign. 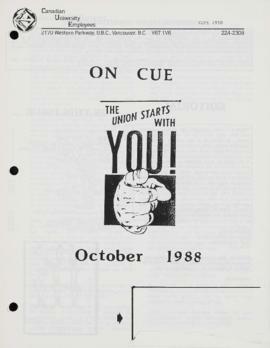 On Cue, September 1988 includes advertisements, union office noticements, letters to the editor chiefly regarding free speech in the newsletter and Australia Exchange, article on the collective bargaining process, notice of contract articles, information on job reclassifications, Grievance Committee report, notice of courses offered by the Canadian Labour Council, Treasurer's note, minutes of extraordinary executive meeting dated June 24, 1988, minutes of special executive meeting dated July 8, 1988, and agenda for general membership meeting dated September 15, 1988. 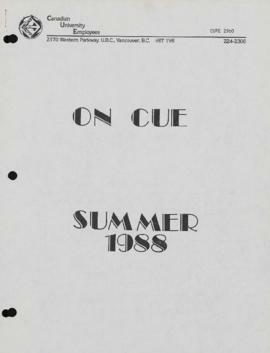 On Cue, Summer 1988 includes listing of CUE representatives, reprinted articles from AUCE newsletter dated June 1981, article on basic parliamentary procedure, letters to the editor, article on the collective bargaining process, notice of fall membership meeting dates, minutes of executive meeting dated May 25, 1988 , financial statements, and minutes of general membership meeting dated June 15, 1988. 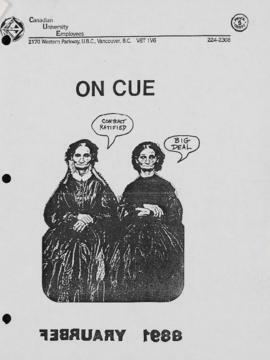 On Cue, Juin 18889 [sic] includes listing of CUE representatives, Communications Committee report, article on the collective bargaining process, advertisements from Vancouver women's groups, article on basic parliamentary procedure, Grievance Committee report, executive meeting minutes dated April 27, 1988, financial statements, general membership meeting minutes dated April 5, 1988, and a general membership meeting agenda dated June 15, 1988. 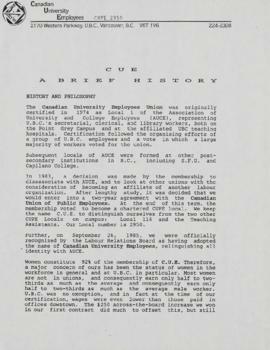 On Cue, Mai [sic] 1988 includes listing of CUE representatives, letters to the editor, a Grievance Committee report, reprinted articles regarding health and safety at work, advertisements for benefits, article on basic parliamentary procedure, article on the collective bargaining process, notice of membership meeetings, executive meeting minutes dated March 15, 1988 to April 13, 1988, 1987 Auditor's Report fulfilled by Dunwoody & Company, and a call for participants on the Contract Committee. 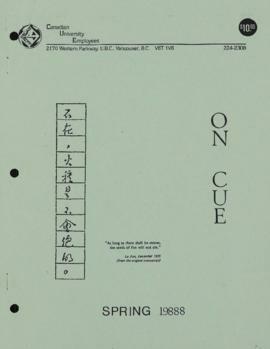 On Cue, Spring 19888 [sic] includes listing of CUE representatives, printed correspondence chiefly regarding On Cue covers, notice of first annual MayWorks festival, article regarding indexing of pensions, notice of community conference on privatization, Hiring Committee report, notice of Payroll Department staff shortages, Grievance Committee report, notice for day of recognition for workers killed or injured on the job, personals, and a blank volunteer sign-up form. 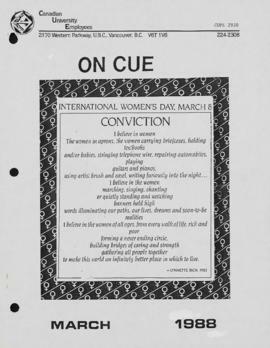 On Cue, March 1988 includes a poem celebrating International Women's Day, listing of CUE representatives, letter of resignation from CUE President, letters to the editor regarding newsletter covers and a staff restaurant, open letters and articles expressing solidarity for International Women's Day, reprinted Vancouver Sun article regarding teacher unionization dated February 4, notice of available courses from the Canadian Labour Congress and Capilano College, articles on sexual harassment, and article protesting privatization.